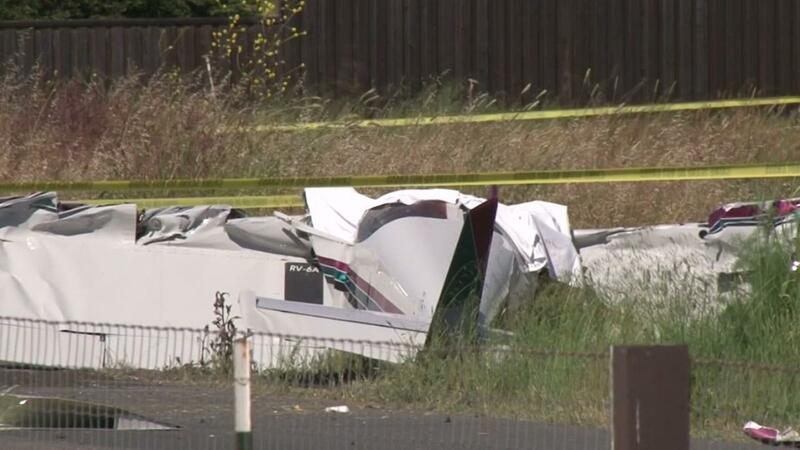 On Sunday afternoon, a small plane fell from the sky half a mile from Petaluma Municipal Airport, killing the two people on board. Jim King was playing golf on the court right next to the airport when the plane dropped off at 4pm Sunday. "It took power, it faltered and we all looked each other in the eye and it did not sound right," he said. King and his friends are used to planes leaving the airport and immediately knowing something is wrong. "Finally it sounded like it was completely strangled and whirled down the street," he said. "Played with a few firefighters today," said Tom Graham, who was also on the golf course when the plane crashed. He said the firefighters "rushed over, I did not go over, and they came back and blessed themselves and said they were dead." Police say a man and a woman are aboard the plane Both were killed in the crash. After one NTSB The Vans RV6 was an amateur-made aircraft that had been in service for a long time. "At this time, the cause of the accident is unknown," Lt. Brian Miller of the Petaluma Police Department, who added, "It is our understanding that it took off and perhaps tried to return to the airport." Late Sunday night, a low loader and a crane arrived to clear the plane from the aircraft Vacate East Washington Street. The NTSB and the FAA are investigating the crash. The aircraft is registered at an address in American Canyon.